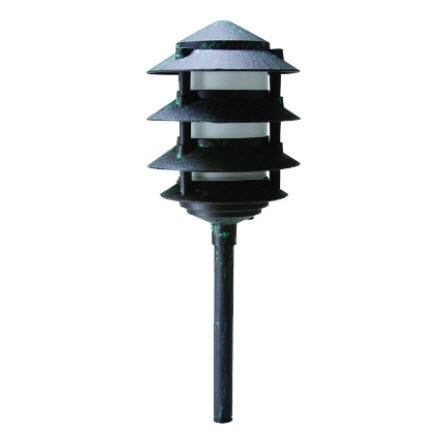 LED 4-Tier pagoda light fixture with ground mount stake and verde green finish for many types of general ground lighting needs. This is LED with only 3 watts and 12 volts and has everything you need to install. It's made from die-cast aluminum with polyester powdercoat finish so it's going to give you long service life. It's attractive classic design makes it perfect for any yard and garden lighting application. There are so many ways to use this low wattage energy-saving LED pagoda light fixture, you can use your imagination!